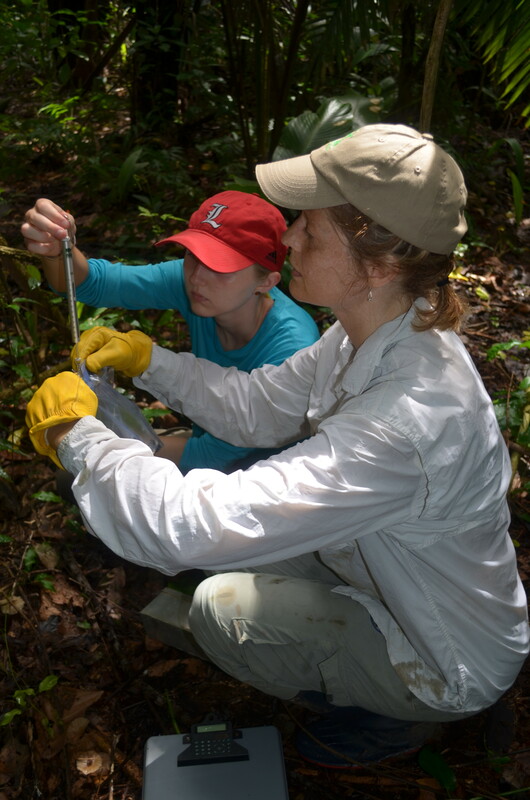 Dr. Sara Ash and Audrey Ash weigh one of the small mammals trapped in the forest grid. concerns in the disciplines of ecology and conservation biology. exercise will result in enough data that students will gain practice in summary and interpretation of results. 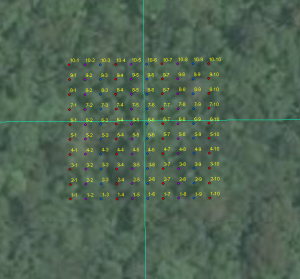 The Silver exercise is similar except that trapping occurs only on the cacao grid. The Bronze exercise is a small scale demonstration that will allow students to practice methods for studying small mammals and the chance to see some of the species living on BFREE’s property. Click here for links to further instruction including video demos. Table 1: Expected level of investment required to complete field exercises. Below find a brief overview of each exercise. Detailed background information and methods are provided in the instructor/student guides for each exercise. A student worksheet is provided in the gold and silver exercises to facilitate data analysis and interpretation. BFREE map (property outline in purple) with location of trapping grids indicated in red. 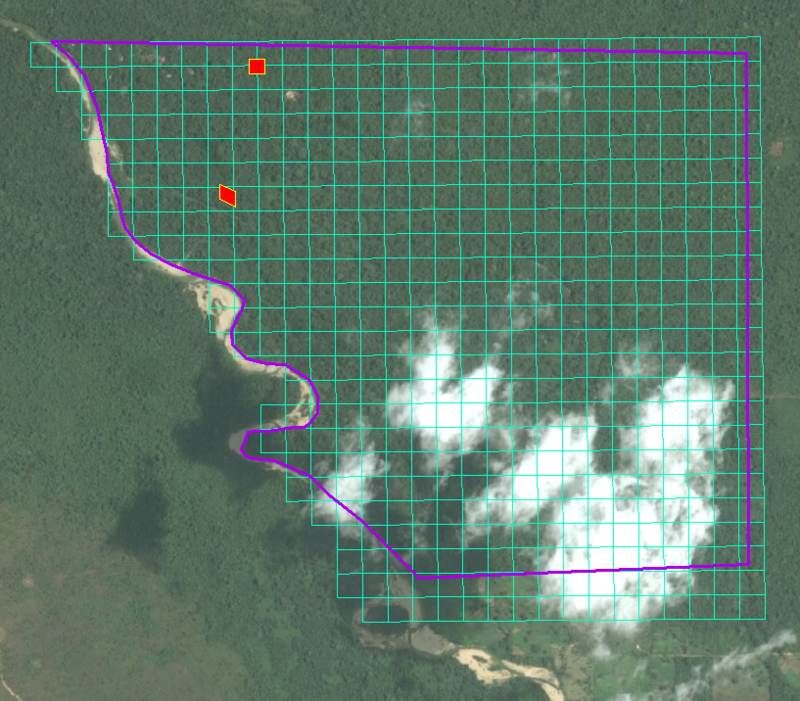 Cacao grid is located approximately 0.5km north of forest grid. 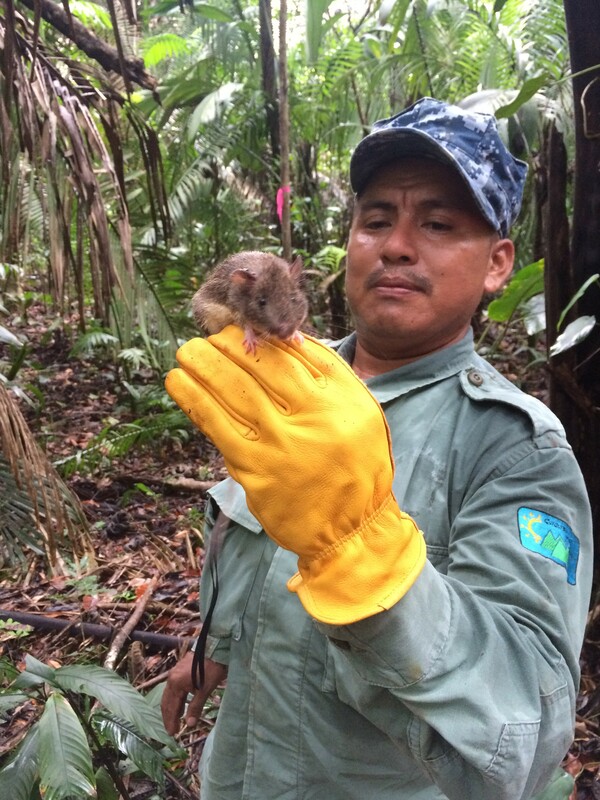 Principal Ecological Question Addressed: How does community composition and structure of small mammal community differ between rustic cacao and nearby tropical broadleaf forest habitat and within a habitat through time? Assuming a minimum class size of 4 students, initial trap set-up will require approximately 4 hours. You should check traps a minimum of 4 mornings after initial set-up. Processing of animals each morning will take about 2 hours. Removal and cleaning of traps will require 6 hours. One 2-hour class period can be used for analysis and interpretation of the results. Alternatively, the analysis and interpretation could be assigned as homework. Principal Ecological Question Addressed: How does the composition and structure of a small mammal community vary through time within a rustic cacao habitat? Assuming a minimum class size of 4 students, initial trap set-up will require approximately 2-3 hours. You should check traps a minimum of 4 mornings after initial set-up. Processing of animals each morning will take about 1 hour. Removal and cleaning of traps will require 3-4 hours. You can devote one 2-hour class period for analysis and interpretation of the results. Alternatively, the analysis and interpretation could be assigned as homework. Principal Ecological Question Addressed: What is the composition of a small mammal community within a rustic cacao agroforestry habitat? 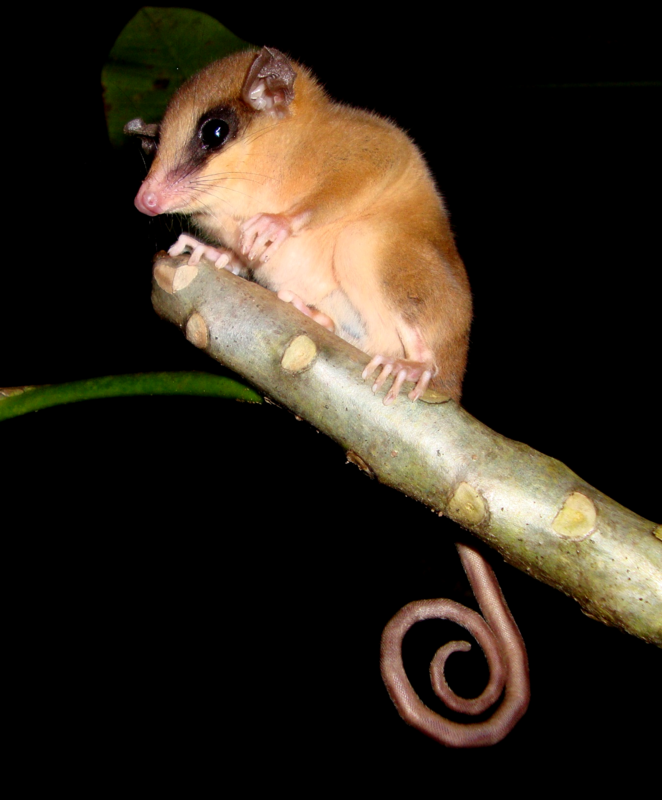 Sipriano Canti holds a spiny pocket mouse. Canti has been instrumental in establishing the research grids. Assuming a minimum class size of 4 students, initial trap set-up will require approximately 2 hours. You should check traps a minimum of 3 mornings after initial set-up. Processing of animals will take about 30 minutes each morning. Removal and cleaning of traps will require 2 hours. Daily, G.C., P.R. Ehrlich, and A. Sanchez-Azofeifa. 2001. Countryside biogeography: use of human dominated habitats by avifauna of southern Costa Rica. Ecological Applications 11:1-13. Daily, G.C., G.Ceballos, J. Pacheco, G. Suzan, and A. Sanchez- Azofeifa. 2003. Countryside biogeography of neotropical mammals: conservation opportunities in agricultural landscapes in Costa Rica. Conservation Biology 17(6):1814-1826. De Beenhouwer, M., R. Aerts, and O. Honnay. 2013. A global meta-analysis of the biodiversity and ecosystem service benefits of coffee and cacao agroforestry. Agriculture, Ecosystems, and Environment 175:1-7. Greenberg, R. Biodiversity in the Cacao Agroecosystem: Shade Management and Landscape Considerations. Smithsonian Migratory Bird Center. Krebs, C.J. 1998. Ecological methodology. 2nd edition. Benjamin Cummings. 620 pages. Magurran, M. 2004. Measuring biological diversity. Blackwell Publishing. 256 pages. Pardini, R., D. Faria, G.M. Accacio, R.R. Laps, E. Madriano-Neto, M.L.B. Paciencia, M. Dixo, and J. Baumgarten. 2009. The challenge of maintaining Atlantic forest biodiversity: A multi-taxa conservation assessment of specialist and generalist species in an agro-forestry mosaic in southern Bahia. Biological Conservation 142:1178-1190. Reid, F. 2009. A field guide to the mammals of Central America and southeast Mexico. Oxford University Press. Rice, R.A. and R. Greenberg. 2000. Cacao cultivation and the conservation of biological diversity. Ambio 29(3):167-173. Schroth, G. and C.A. Harvey. 2007. Biodiversity conservation in cocoa production landscapes: an overview. Biodiversity Conservation 16:2237-2244. Sikes, R.S., W.L. Gannon, and the Animal Care and Use Committee of the American Society of Mammalogists. 2011. Guidelines of the American Society of Mammalogists for the use of wild mammals in research. Journal of Mammalogy 92(1):235-253. Tilman D., Fargione J., Wolff B., D’Antonio C., Dobson A., Howarth R., Schindler D., Schlesinger W.H., Simberloff D., and D. Swackhamer. 2001. Forecasting agriculturally driven global environmental change. Science 292: 281–284.